Mainstream America is Ready for Bar Codes – Converging "Realspace" and "Mobilespace"
One thing that has become obvious as of late is that along with educating people about the mobile Internet, it’s necessary to also offer tools that provide easy access to it. This is especially true when it comes to helping people discover and connect with off-portal mobile content and services. Part of this requires finding solutions that are successful at making connections between the physical world and mobile Internet. One of the tools which aim to converge “realspace” and “mobilespace” are bar codes (think of them as a form of physical hyperlink.) It works like this. Let’s say you’re walking along a sidewalk and someone hands you a flyer. Glancing down you notice a bar code placed neatly within the design. Immediately you take a photograph of the bar code with your mobile phone. Software on your phone converts the snapshot of the code into a mobile address. You are automatically offered the option to launch this address in the phone browser. Doing so launches your mobile browser and you are taken directly to the linked content — jumping you from printed content to online content. You might be asking yourself about now, “Gee. I don’t know if people will actually do that?” Well the short answer is – people already do, lots of them in fact. 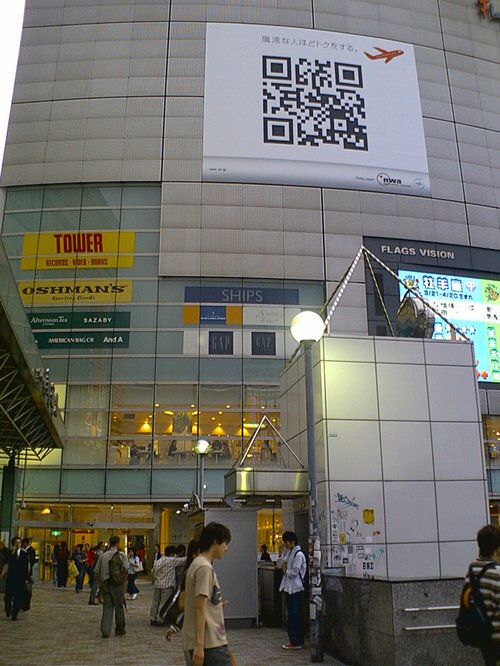 In Japan, for example, QR codes have become part of everyday life, available on everything from business cards, id cards, magazines, newspapers, flyers, posters, stickers, food products,puzzles, web sites, billboards, more billboards, CDs, confectionary delights, calling a cab, vending machines, coffee cups, advertisements, and tickets –- even including the occasional booth-babe (my apologies to Darla Mack). All these little codes eagerly await — ready to link people to content that matters to them — mobile sites, profiles, videos, podcasts, products and other little pieces of content (think ringtones and wallpapers). Individuals also have joined in on the opportunity as publishers themselves — printing codes on stickers, placing them on their web sites or blogs, even walking around with cute little stampers to easily affix codes practically anywhere for any reason. As such, QR Codes have become the door to the mobile Internet for the average mobile user. Others like the creative team of Kevin Slavin and Frank Lantz from area/code turn city streets into huge public game boards using bar codes and cell phones as part of the game play. Still not convinced people find this useful, fun or both? To highlight potential, I’ve provided results from a survey originally taken by InfoPlaint in Japan that was carried out at the end of August 2005. The respondents selected the survey themselves via a link in the DoCoMo iMode menu system. 7,660 people completed the survey; 5,023 of them were women. 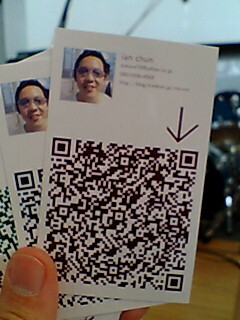 Q: Do you know about QR codes (2D barcodes)? Looking at the age breakdown, for both males and females almost 90% of the under 20’s use them, but the rate steadily drops down to end up at just about half of all the over 50s. There was no significant differences between the sexes, except for almost two and a half times more women used mail-order catalog QR Codes. Okay, so I’ve tried to do a bit of convincing but to what end? I see it this way, Winksite is the quickest way to build a mobile audience. Our RSS-driven publishing tools let you simply and easily add your information to the mobile Internet in ways that thrill mobile users. Thousands operate mobile spaces at Winksite with the added benefit of community features such chat, forums, and polls. We also want to help our publishers and their fans promote their space to mobile users. One way we do this is by aggregating our communities into a blog sidebar where mobile and desktop users find each other by interest and location. Another way is to help people promote their spaces in everyday situations and circumstances. Current camera phones now have good enough optics, resolution and processing power to be able to read these special bar codes on the printed materials we come across each day. As such, Winksite now provides a set of unique bar codes for each of our publishers that link directly to their mobile sites and communities. With the ability to create a universally accessible mobile site that’s connected to physically distributed bar codes, we see our publishers creating a wide range of useful applications. As the World Wide Web showed, things really take off when users build out their own real estate. The success of the Web was partly a result of the distributed development of local content and economies driven by individual passion. It’s happening all over again on the mobile web. Be a part of it. Please Note: “Booth-Babe” photo provided by news.3yen.com. The feeds below are listed alphabetically. WIL WHEATON dot NET: Where is my mind? In my previous post I briefly mentioned the recently launched Winksite Mobile Feed Directory. The directory contains over a thousand feeds selected by our editor from among the millions of news and blog feeds available worldwide. Unregistered visitors to our Mobile Feed Directory can browse and read the content contained within these feeds. Registered Winksite members who have built a mobile site have the additional ability to personalize the included Mobile Feed Reader (Syndicated Feeds Channel) by subscribing to any of these feeds, organizing them into their own categories and adding favorites of their own. Please Note: The Feeds Contained Within These Categories Are Provided for Personal and Non Commercial Use Only. Please Note: This list is a snapshot of our Mobile Feed Directory as of 09/17/2004 09:42:15 PM. Additional categories and feeds are added on a weekly basis. What Are Feeds And What Do They Have To Do With Content Syndication? “RSS and Atom are two flavours of what is more or less the same thing: a “feed” which is a wrapper for pieces of content.XML is the base technology both are built on.” – from mezzoblue.com. Syndication is the process of using RSS and Atom feeds to share, distribute and access the content contained within them. By using feeds, Web content providers, services and individuals can easily distribute data that can include, for example, weblog posts, photos, news, headlines, weather, events, custom eBay searches, real estate listings, classifieds, even feeds for tracking your UPS or Fedex package. Thanks to widespread support of standards, feeds have evolved into a popular means of sharing content between sites (including Google, Yahoo, BBC, Reuters, CNET, Slashdot, ZDNet, and more) and is now going mainstream as more and more people become aware of its benefits. How Are Feeds Used On The Tethered Internet? Using programs known as news aggregators (also called news readers or feed readers) to collect, update and display feeds for you. This is useful for collecting news and weblog posts in one place so you can scan headlines and read items without having to visit multiple sites. Basically it works like this. Say you’re reading a weblog in your browser, and you want to subscribe to its feed. You click on the XML button, or the Syndicate this Site link, or whatever it is. You are then provided with a URL to insert into your news aggregator. Once entered you can then access that site’s content from the reader along with your other feeds. Using feeds to incorporate content into a web site or weblog. Weblogs or “blogs” are web pages usually comprised of short, frequently updated items and web links. Blogging as a publishing tool is used for many purposes: traditional journalism, personal journals, group discussions around a topic, and many combinations in between. Using feeds to share event lists with friends, family and colleagues. Using feed search tools such as Feedster and Technorati that index feed content to discover and follow news as it breaks. For example, once a search has been created you could then add the “search results” feed to a feed reader so you can “check” your search query every day to see if the results have changed. How Are Feeds Used To Publish And Access Content On Mobile Devices? Fire up your phone’s mobile browser and point it to winksite.com. Here you can access the Winksite community anytime, anyplace. You will notice on our mobile portal main menu a link to our “Feed Directory.” Contained within are more than a thousand of the world’s most popular feeds with additional categories being created each week. Within the Feed Directory you may read the individual post and news items, send the items to you or to a friend’s email, or subscribe to a feed you like for access within your own personalized mobile feed reader (You must register with Winksite to take advantage of this free service. More on this below.) Just think how convenient this would be while on your train or bus ride to work or school. Activate a mobile blog of your own at Winksite. Each blog includes feeds for syndication (all flavors). You have full control over these feeds and the geo/meta data contained within it. If you already have a blog with a service such as Radio Userland, Movable Type, Blogger, or Live Journal, you can mobilize your existing feed, instantly creating a mobile edition of your blog. We call it the Syndicated Feeds channel. You can call it whatever you wish. Each mobile site you create at Winksite includes a “Syndicated Feeds” channel. Using this channel as a mobile feed reader allows you to connect to your favorite Weblogs and news feeds while on the go. The “Syndicated Feeds” channel can also be used for publishing feeds to a community. Unlike other mobile feed readers, the feeds you subscribe to at Winksite can be shared with the visitors to your mobile site. This single difference changes the potential of how feed syndication can be utilized in a mobile environment. Accessing various categories of feeds from your mobile device while “on the go” seem to make so much more sense then from your desktop. For example, combinations of content, weather and event feeds can be combined to support the development of city guides and directories. Furthermore, you can choose to activate ancillary mobile channels (i.e. mobile chat, forum, community blog and polls) that transforms this mobile content space into a communication, collaboration and coordination space. Note: List courtesy of RSS Specifications. Feedster is a search engine for weblogs and other Internet information syndicated as RSS or ATOM providing fresh news and opinions. Feedster™ has teamed up with Winksite to provide the mobile community with the same innovative features they experience on their desktop. With Winksite you can mobilize Feedster searches and feed papers. How Are Feeds Going To Be Used Within Winksite Mobile Channels In The Future? Generate feeds for all channels of a mobile site including events, forum, etc. Provide feeds for business cards so contact info can be centrally updated and distributed. Provide wizards to import custom XML feeds (and spreadsheets) into your mobile site so that content published in other content management applications can “feed” everything from your events calendar, to a restaurant directory or retail locator. Then, based on zip code automatically link in relevant direction and weather feeds. OPML support for the importing and exporting of feed lists. Feed splicing – Services like Feedburner are doing some cool things like working with Flickr to splice together photo and blog feeds. Well, we think there is a great future in that type of thing. Have a large audience? Perhaps, you will want to splice an advertisement feed into your blog feed and try developing a revenue stream from sponsors. More on the uses of combining feeds in a future post. Enable access to XML webservices for directions, maps and stock quotes. And generally, provide tools to more easily discover and generate feeds of interest or usefulness to those who enjoy a mobile lifestyle. We’ve spent close to three years developing our platform that lets individuals publish, share, broadcast and interact with mobile content in ways not previously available. We made Winksite so simple that if you know how to make a phone call or use voice mail you will understand how to use it after a single glance. Now that the core Winksite platform is complete and a significant amount of data usage is streaming through the system, Winksite is growing to include Photoblogging, Downloads, Group Messaging & Coordination, Location-Based Services, Microcontent Payment Systems, Personalized Content Feeds, SMS/MMS Feed Notification Services, Personalized Interfaces/Skins, Automated Enterprise Content Syndication, Form Builders, Rich Media Delivery, Social Network Mapping (FOAF), Paid Search & Content Listings, XHTML, BREW and Flash Lite UI, Direct Integration with Weblogs and other valuable features. As an intrinsically XML-based system, Winksite will grow into the role of a clearinghouse mobilizing content both local and global in nature, becoming embedded into other companies’ web sites in ways not possible for other content publishing or blogging systems. The features that we add to the system will have APIs accessible that third parties can use to tap into our services at the data level, creating innovative services enabled by the WINKsite platform.